More and more often, respondents use mobile devices such as tablets and smartphones to participate in market research surveys. This requires us as researchers to adapt our survey interaction design to the specifics of mobile research. We don’t just change the look of the surveys through smart interaction design, we also optimize their content: shorter and more engaging questions and choice exercises. At SKIM, we are continuously developing in this field of mobile research. Browse through our recent publications and presentations to find out how we are making sure that the results of a mobile research study are valid and compatible with the results from a traditional platform. In today’s digital world, mobile devices are at the center of our daily routines. From sunrise to sundown, we search, share, watch, like, and swipe. To keep up, marketing professionals have to adjust to this new reality and change the way they interact with consumers when doing research by utilizing implicit research. To truly connect, the way things are measured also needs to change. Measuring purely rational processes is no longer good enough. Instead, bridging rational and emotional drivers is key to accurately predicting how consumers behave and decide. Inspired by these developments, we created Unspoken®, a new technology that blends implicit research techniques with an engaging mobile interface. We are proud to introduce our latest innovation: Unspoken, a new technology that blends implicit research techniques with an engaging mobile interface. People are shown a series of stimuli and swipe right if they like it or left if they don’t. In another exercise people compare and consider different options and tap on the one they prefer. It’s intuitive, quick and fun. 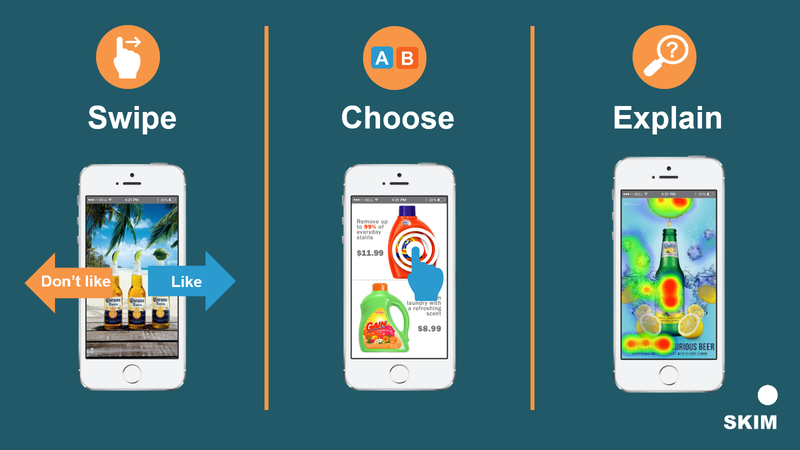 Reaction time, swipe velocity, and the actual choices are used in the analysis phase to model which ads, messages, or products have the most potential to break through the clutter and eventually convert shoppers at the moment of truth. Download the one-pager for Unspoken®! If you need a short and sweet explanation of how this innovative mobile research method can help you, download our one-pager below in PDF.